The credibility assessment is a core part of the adjudication of asylum applications. Status determination requires the decision-maker first to establish the material facts in the case. The credibility assessment is an integral part of this first stage. The credibility assessment involves a determination of whether and which of the applicant’s statements and other evidence relating to the material elements of the claim can be accepted. This therefore determines which are taken into account in the analysis of whether the applicant has a well-founded fear of persecution in terms of the 1951 Convention relating to the Status of Refugees (1951 Convention) and/or faces a real risk of suffering serious harm in terms of Directive 2011/95/EU of the European Parliament and of the Council of 13 December 2011 on standards for the qualification of third-country nationals or stateless persons as beneficiaries of international protection, for a uniform status for refugees or for persons eligible for subsidiary protection, and for the content of the protection granted (Qualification Directive or QD), if returned to his or her country of origin, or in the case of a stateless person, to his or her country of former habitual residence. The assessment of credibility is often the pivot upon which the outcome of the first instance determination procedure turns. In the exercise of its supervisory responsibility under its Statute and Article 35 of the 1951 Convention, the United Nations High Commissioner for Refugees (UNHCR) has noted a trend across European Union (EU) Member States whereby first instance negative decisions on applications for international protection often seem to result from the fact that key elements of the applicants’ statements are not accepted as credible. In addition, while recognizing the different national legal traditions within the EU, UNHCR has noted that there is not a common understanding of and approach to the credibility assessment among its Member States. With the exception of guidance pertaining to a few aspects of the credibility assessment in Article 4 QD and some relevant provisions in Council Directive 2005/85/EC of 1 December 2005 on minimum standards on procedures in Member States for granting and withdrawing refugee status (Asylum Procedures Directive or APD), the EU asylum acquis provides little guidance on this core task of status determination. The UNHCR Handbook on Procedures and Criteria for Determining Refugee Status, (UNHCR, Handbook), and the UNHCR Note on Burden and Standard of Proof, provide some additional guidance. In September 2011, the Hungarian Helsinki Committee, in partnership with UNHCR, the International Association of Refugee Law Judges and Asylum Aid (UK), launched a project, Towards Improved Asylum Decision-Making in the EU (also known as ‘Credo ’), which aimed to contribute to better structured, objective, high-quality and protection-oriented credibility assessment practices in asylum procedures conducted by EU Member States, as well as to promote a harmonized approach, reflecting relevant provisions in EU law and international and regional standards. The project received financial support from the European Refugee Fund (Community Actions strand) of the European Commission. This report represents a summary of the main findings of the research conducted by UNHCR as part of this project. 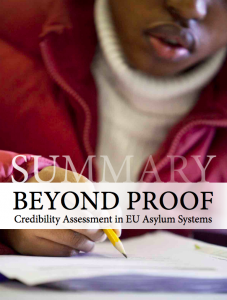 The full report of Beyond Proof – Credibility Assessment in EU Asylum Systems is available in the CD-ROM at the back of this document. The full report contains complete references to relevant supporting material and sources, as well as more detailed analysis and explanation of the information contained in this summary.